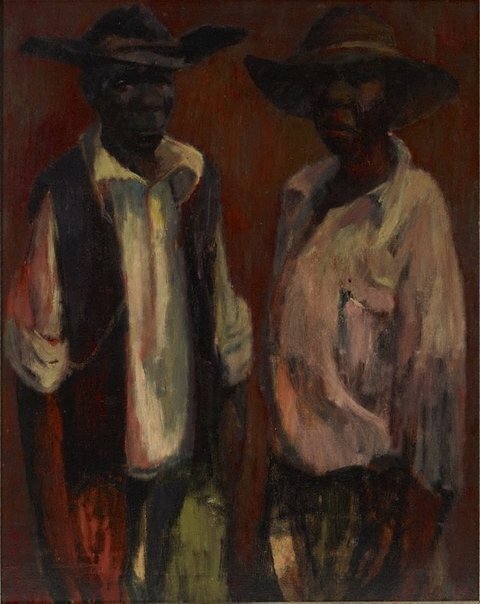 In 1951 Russell Drysdale travelled to Cape York Peninsula in northern Queensland where he developed an interest in Indigenous Australians as a subject for his work. Many of the paintings he produced during this time depict Aboriginal subjects in urban and rural settings, and reveal the artist’s objective compassion toward the people he met and painted. These works formed a significant social comment on the sense of displacement experienced by Indigenous people during the early 1950s in Australia. 'Aboriginal stockmen' emanates from this period and presents two young Indigenous Australian stockmen standing side-by-side in a photographic-type format. Portraying the young men at a close proximity – in comparison to related works, such as ('Group of Aboriginal people') (1953) – the painting establishes a more intimate connection between its subject and the viewer. Look , 'Lost boys from the bush found in the city', pg. 10, Sydney, May 2015, 10, 28 (colour illus. ).